For the next several decades, fried pickles gradually worked their way into restaurant and food culture in general. Texans often like to lay claim to the snack, but the earliest evidence of Texas fried pickles emerge from state fairs in the 1980s and state fairs across the country have been a popular place to find the snack for at least the past 20 years. They have now transitioned from Southern novelty to staple most often found in the starter section of restaurant menus, chains including Chili’s, Hooters, Texas Roadhouse, and Buffalo Wild Wings now all serve versions of the addictive snack. Certain pockets of the country seem to have taken to the pickle more than others — for instance, at least 25 bars and restaurants in Washington DC offer a version, including Cajun restaurants, dive bars, and fancy cocktail lounges. They are also commonly available at barbecue joints, dairy bars, and pubs throughout the Southern states, where bar-goers are as likely to snack on them as they are on wings or nachos when taking in a game. The internet is another factor involved in the mainstreaming of the snack with copy-cat recipes for at-home cooks who wish to mimic the Hooters or Texas Roadhouse taste. Restaurants also argue over whether cornmeal or flour creates a superior batter. Dipping sauces range from remoulade to French dressing, and as housemade artisan pickles gain popularity across the country, restaurants more focused on making items from scratch tend to provide artisan takes on the deep-fried pickle. Many new eateries have popped up in the city over the last while, not just limited to Galway’s jammed Asian street food scene any more. These new arrivals include Tomodachi, a recently-opened sushi bar across from Brown Thomas, Tig Noras, a very chic gin bar on Cross Street, and a Starbucks. Hungry Bear is situated in the heart of Galway’s growing gastronomy scene. It offers modern Americana cuisine in a relaxed atmosphere with freshly prepared, locally sourced foods, and for the first time gives us access to authentic fried pickles. The arrival of Hungry Bear on Eyre Square means that the good people of Galway can try this acquired taste for themselves. It is not just about pickles, however, Hungry Bear is first and foremost a fast food restaurant with a difference. The beef is grass-fed, the chicken of the highest welfare quality, and the homemade sauces are additive free. Formerly Hilbillies, the restaurant has undergone a menu and interior revamp and the vision now is to create a traceability factor, so customers can be assured where their food is coming from, a wholesome food restaurant. The menu is broken into chicken, grilled and fried, burgers, vegetarian, and salads. 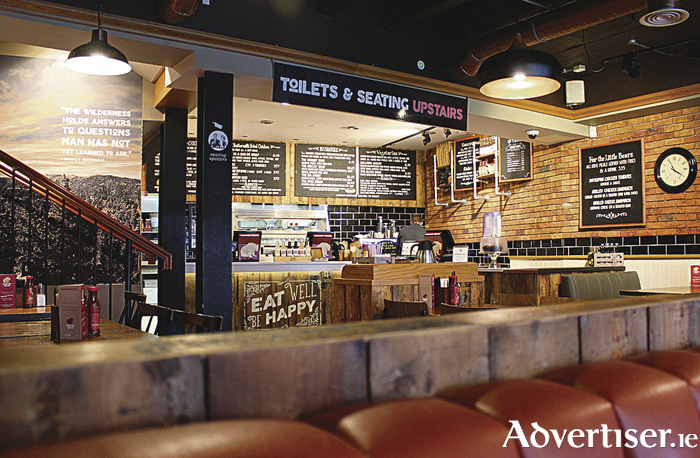 There is also a junior menu and a list of sides and sauces, and the interior is American diner with rustic touches. We have seen the rise and fall of hot dogs, ribs, and burritos, and the popularity of burgers never seems to die. Last year has seen some improvements, starting with the mainstream launch of Supermac’s fresh meat beef burger, the first fresh meat burger available in a quick service food chain in Ireland. Then there was an excellent burger at the Chili Shack on Abbeygate Street, but one that involved a long wait, and the Harlowe burger, only available to a limited audience by delivery. Enter Hungry Bear where the burgers are carefully constructed, with bun, filling, and sauce that work together. The team do not overlook condiments either, understanding that ketchup and mustard are as important to a burger as the meat or the bun, in terms of the punchy flavours they add. Predictably, as a restaurant focused on all things wholesome, the vegetarian options are particularly noteworthy also, one of the best bean burgers I have encountered. Hungry Bear is taking the bull by the horns and providing a fast casual dining experience in Galway that promises a farm to fork experience, a food revolution to support local and provide customers with wholesome food – made fast. It is that rare fast food restaurant where diet-conscious diners will be satisfied while also catering to the whole family, while accommodating such diets as gluten free, paleo, and vegetarian. It may be one of many new eateries that have popped up in the city over the last while, and it will face intense competition locally. But, if the buzz that met its opening is anything to go by, Hungry Bear is sure to be a hit. There is nothing wrong with fast food when it is fast food done like this. There is a respect for ingredients and immense pride in the product. Don’t forget to try the pickles. Hungry Bear, 30 Eyre Square, Galway. Tel: 091 375158.